Foreign diplomats, CEOs and media representatives came together Monday in Istanbul to exchange ideas and listen to a presentation by President Recep Tayyip Erdoğan's chief adviser Gülnur Aybet, at an event hosted by Daily Sabah. The event, organized in cooperation with the Istanbul Consular Corps – a body of consulate representatives in Istanbul – and sponsored by Gap Inşaat, was held at CVK Bosporus Hotel. A keynote speech, following a meet-and-greet hour, offered foreign business leaders and diplomats insight into Turkey's political agenda and its role in the international community. Aybet informed consul generals and executives of international companies working in Istanbul about Turkey's Operation Olive Branch in Afrin, Syria. "There have been some distortions in some international media since the beginning of Operation Olive Branch. We need to explain […] our reasons for the operation better," Aybet said during her presentation. Aybet explained Turkey's rights based on international law, as well as holistic goals such as refugee repatriation to the region, in regards to the operation launched on Jan. 20 to clear PKK-linked People's Protection Units (YPG) and Daesh terrorists from northwestern Syria. Aybet also gave insight into the future stages of the operation, stating the first stage in the Afrin region was nearly complete. Turkey is engaged in talks with NATO allies, including the U.S., about the next stages of the operation, she added. Daily Sabah Editor-in-Chief Serdar Karagöz, Hungarian Consul General in Istanbul and head of Istanbul Consular Corps Balazs Hendrich, and Mayor of Beyoğlu Ahmet Misbah Demircan also addressed the audience at the event. 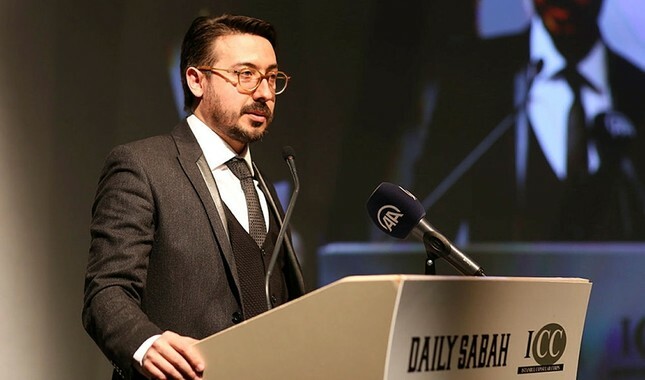 In his keynote speech, Karagöz touched upon Daily Sabah's role in providing perspective on Turkey's political realities, which has made it a trusted source of news and opinions. "Turkey is changing. The rapidly-changing character of Turkish society and politics is sometimes confusing and not easy to understand. We know that. This is where Daily Sabah comes in. Our reports, news analyses, opinions and columns will help you understand Turkish public opinion. Daily Sabah is the perfect medium for all to see how Turkey reacts to the changing world," he said. Karagöz noted that 2019 will be a significant year for Turkey, with three critical elections to be held and a continued range of security threats, namely the PKK, Daesh and the Gülenist Terror Group (FETÖ). Turkey is going through a period that calls for extreme measures, he pointed out. Turkey's friendships and alliances were tested by the "bloody" coup attempt in 2016, he said, noting that other countries' stances toward the terrorist groups and the coup attempt are "what defines a friend or a foe for the Turkish public." "To understand Turkish public opinion on these issues, closely follow Daily Sabah. We know what an average Turk thinks, and you will know how Turks understand the world," he added. The program also featured a live performance by electric violinist Giselle Tavilson.